The World's Smallest Tow Truck It didn't actually say, but it's hard to believe that there are any smaller ones. This was used as a promo for a towing company but i think that it was able to tow a small economy car at one point. 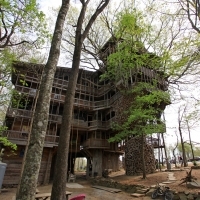 One thing on our to do list in Chattanooga, besides doing what the sides of barn’s from Michigan to Florida told us to do (and that is to Visit Rock City! 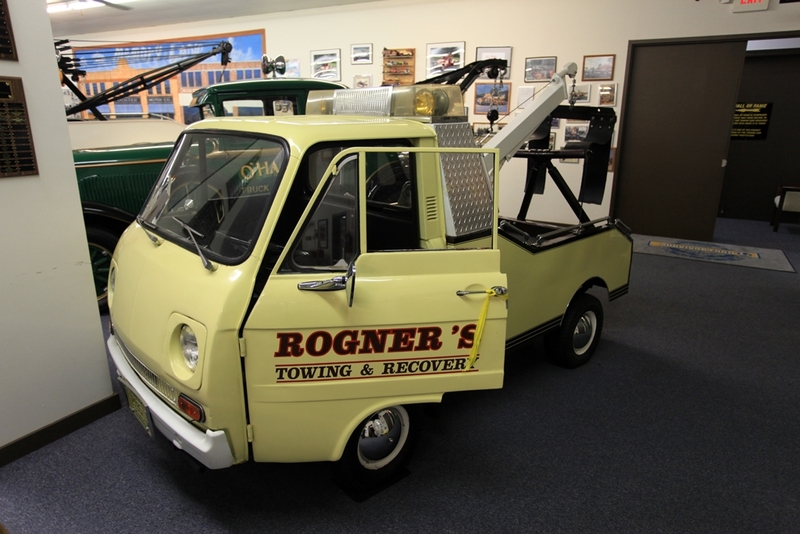 ), was the tow truck museum. Paul and I decided on this trip that neither of us were all that interested in normal art museums, as we have plenty of those at home, but what we don’t have are places like the International Towing and Recovery Hall of Fame and Museum. The museum is in a fairly non-descript building, in fact we drove by it at least once on our way to Lookout Mountain and Rock City, since it’s on the same road. The website for the museum really doesn’t do much to make you want to go there either, they talk a lot about the hall of fame, but not as much about the museum. They get about 10,000 visitors a year, and a good chunk of them are in the industry, so maybe they already know what to expect when they enter the museum. Paul and I both agreed once we got inside that it was totally worth visiting, and the smell of the museum alone might be worth the price of admission, if you are fond of the smell of grease and old cars, which fortunately, we are. The museum has about 20 wreckers and tow trucks, which to be honest I still don’t know the difference, I think tow trucks just tow, and wreckers tow and recover. Most of them are fully restored and super rare, like a wrecker built by the military but that they never used, or a tiny Japanese tow truck that seems purpose built for tiny Japanese cars like our Miata, and nothing bigger. They have a Cadillac that was owned by a fairly flamboyant repo man, that can actually tow a car. A few of the vehicles have lots of before and after photos of the restoration, and most of the stories are about how they found this super rare tow truck in somebody’s barn 10 states away, but fortunately they owned a towing business so they went and got it. It took 10 years, and they had to make some parts themselves, but it was worth it. Being an owner of a weird RV, Paul and I can totally relate. Having never paid much attention to tow trucks, I was impressed by the collection, it was clearly a museum of super rare tow truck’s and tow truck hot rod’s, and must be as exciting for those in the know as the Corvette Museum was for Corvette buff’s. The walls are covered with ad’s for tow trucks, newspaper stories highlighting noteworthy feats of towing, like towing giant motor homes or trying to break speed records in a tow truck, or more impressive, getting a giant piece of mining equipment back onto the road after it went down a huge embankment in South Africa. They brought in 4 of the type of tow trucks you see towing big rigs and they managed to haul it back up. There was also a photo of a “toe truck” that was a normal tow truck with a giant pink foot on top of the roof. Tow Truck Drivers Hall of Fame A giant wall with hundreds of tow truck drivers photos. This was an incredible journey through some excellent hair styles. 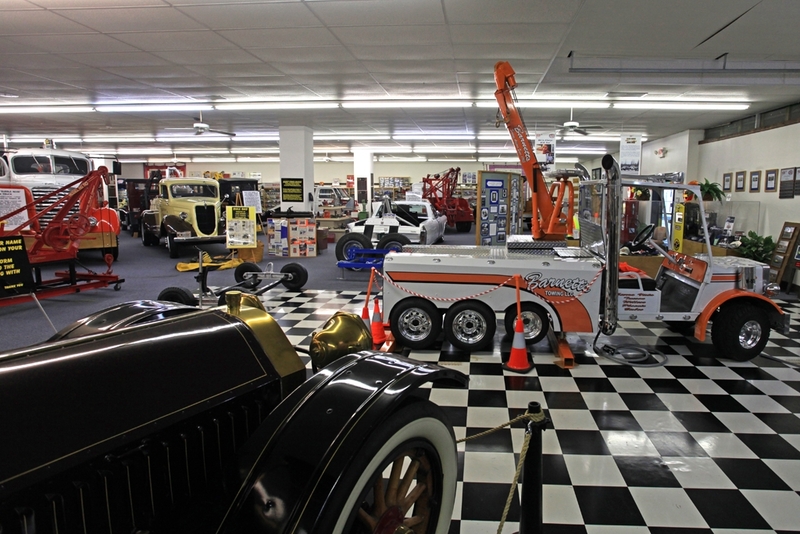 There are glass cases lining the outer walls of the museum that are filled with toy tow trucks from all over the world, which were a gift to the museum from multiple members who gave up their collections. They also have lots of toys of Mater the tow truck from the movie Cars. If you bring a tow truck or toy car obsessed child to the museum, be prepared to spend a lot of time at the outer edges. 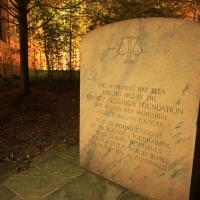 In 1986 they decided to honor those who had made a difference in the industry, and thus the Hall of Fame was born. 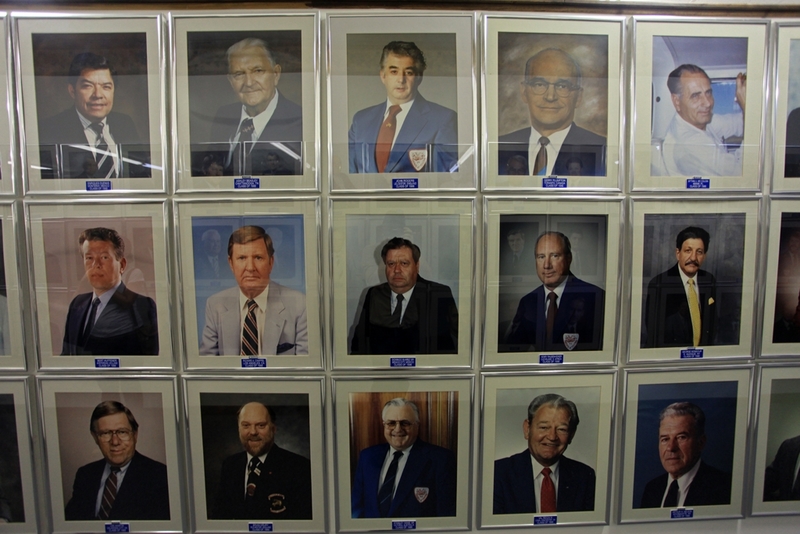 Each September new members are added, they have almost 300 now, and they get a large photo added to the hallway leading from the museum to the gift shop. I think for the first few years they had a lot of catching up to do, since a lot of the portraits have people dressed like extras from Mad Men. Having lots of photos in a row of men in ties and jackets really shows the waxing and waning of tie thickness. 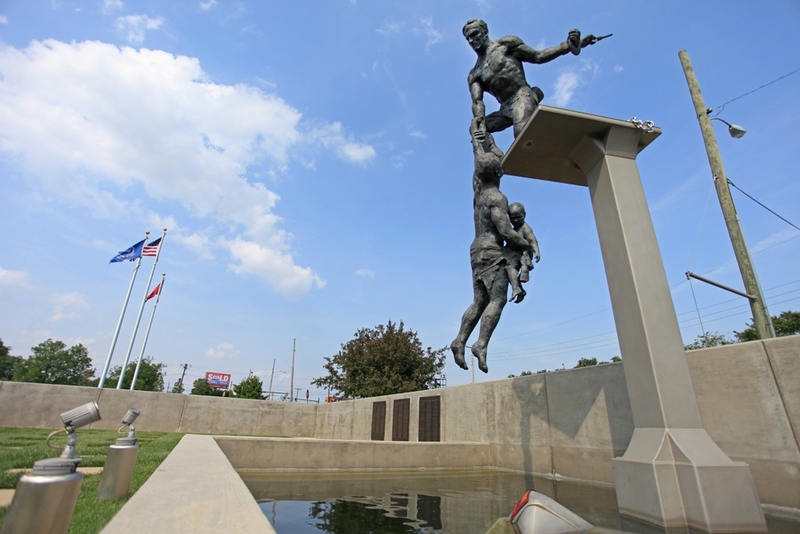 Outside the museum next to the road is en excellent bronze statue of a tow truck driver saving a father and his child from a sinking car. It’s dedicated to the men and women who have lost their lives in the line of service to the towing and recovery industry. The website for the museum has lots of photos of the dedication ceremony, and it looks like at least a thousand people showed up, and I think they deployed the largest American flag I’ve ever seen during the ceremony. The Towing Monument An awesome sculpture of a shirtless tow truck driver saving a person and child from a sinking car out in front of the towing and recovery museum. So why Chattanooga? Turns out the first tow truck was invented just a couple miles up the road in 1916. Somebody lost control of their model t and seeing that it took a bunch of strong men many hours to get it out of the creek, Ernest Holmes Sr. decided there has just got to be an easier way. Fortunately his brother owned a service station, and Ernest was no slouch with cars, so he set about finding a solution, and eventually after a few tries he figured one out, got a patent in 1919 and the modern towing industry was born. His company made tow trucks and wreckers until World War II broke out, but fortunately for them they got a government contract to make recovery vehicles and bomb loaders for the military. Ernest Sr. died in 1945, and The Ernest Holmes Company stayed family owned until 1973 when they sold the business to Dover Corporation and then to Miller Industries, the largest manufacturer of tow trucks, just up the road in Oolewah Tennessee, which is why some call Chattanooga the Detroit of the towing industry. So in short, if you are in Chattanooga, and you like old cars, are in the towing industry, or are fond of offbeat museums, or any combination of the above, then take a bit of time out of your day to visit the museum, so next time you need a tow, you’ll have something to talk to the driver about!